The few Arab tourists we had left for the summer fled or were evacuated by their embassies in the past few days due to the recent unfortunate events, mainly the kidnapping of Syrians and Turks by the Mokdad family’s “military branch”. I went down to Beirut Souks yesterday and it barely took me 30 minutes from Jounieh to get there. I expected traffic at Dbayyeh with Le Mall now open and at Nahr el Mot (City Mall) but didn’t find any. 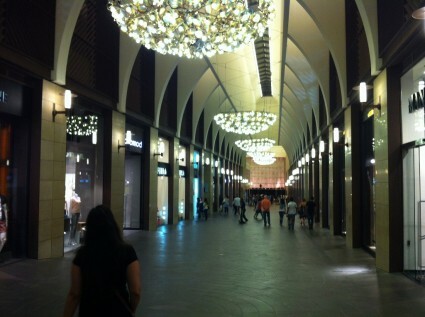 Once I got to Beirut Souks, I easily found a parking spot and the Souks weren’t as busy as I imagined they’d be be. Even the “Man In The Mirror Michael Jackson show” event that was taking place at the Souks wasn’t completely sold out as there were a lot of empty seats. Meanwhile, the random kidnappings of foreigners and Lebanese is still ongoing. All in all, I think this is the worst summer we’ve had in Lebanon for the past 10 years, even worse than the 2006 summer. That’s really sad specially with all the potential we have in this country. Not true. There is still one place in Lebanon where the forests are still standing and the mountains haven’t been touched, Shebaa Farms. I am talking in terms of tourists. We had tourists before the war started and we got some back when it ended. This summer, tourists were warned not to come from the start and the last few ones were evacuated due to recent events. Added to that, we were being attacked by Israel in 2006. In 2012, we are on the verge of a civil war. How certain can you be that the reasons you suggest are in fact the cause of why tourists have left? Maybe they decided (or had previously planned) to returned to their homes to celebrate the holiday with the rest of their families. Maybe they needed to get back home because school was starting soon. Eitherway, one things for sure, 2012 is no where near 2006. Kuwaiti, Qatari and Saudi embassies send planes to evacuate their dissidents. I even say: they left Lebanon just to bring the rest of their family members and come back for a “Let’s get kidnapped” summer vacation! you should go work in the current government as that is the response to everything that happens these days. blame everyone else except the true culprits. It is the work of Israel and its proxies. I say, if Saudia Arabians and Qataris are funding a proxy war for Israel (against Syria and their other common enemy with Israel, Iran) then if these tourists are having to leave Lebanon in such a rush it will only be because of that war and therefore, good riddance. roger…Is everything agent orange related to you? You are so pathetic in seeing Israel’s guilt in your countryman’s utter stupidity!! Syria is Israel’s enemy? Are you sure about that? Syria certainly isn’t Israel’s bed mate, much as KSA and others already are and much as how some Lebanese crave to become! p.s. I am not trying to defend the modern or recent history of Syria with respect to its performance in Lebanon. It is as much to blame for our misery as Israel or as the Lebanese themselves are. However, the events happening there now play well for Israel’s allies and harm their enemies. Syria had been left alone by the Zionist entity since 1974…while Lebanon had been hammered for years! Care to review your premise? Roger it’s high time Lebanese start thinking about their own people and not blaming every wrong on Israel. Syrian regime’s best ally all these years has been Israeli regime….Anyways this is not political blog…So I wish everyone in Lebanon safety and hopefully dual citizenship.